The Palace Guard, the hat, the bears | Notes from the U.K.
Great question, and it led me to an exhaustive ten-minute search. Or maybe that was half an hour. I’ll start my answer with a Mirror Online article about the Ministry of Defense searching for a fake fur replacement for the hats. The article looked like it had been published just that day, but when I checked it again the next day it looked like it had just been published again. In other words, I haven’t a clue how old it is. It’s either breaking news or old—oh, hell, I can’t help myself—hat. 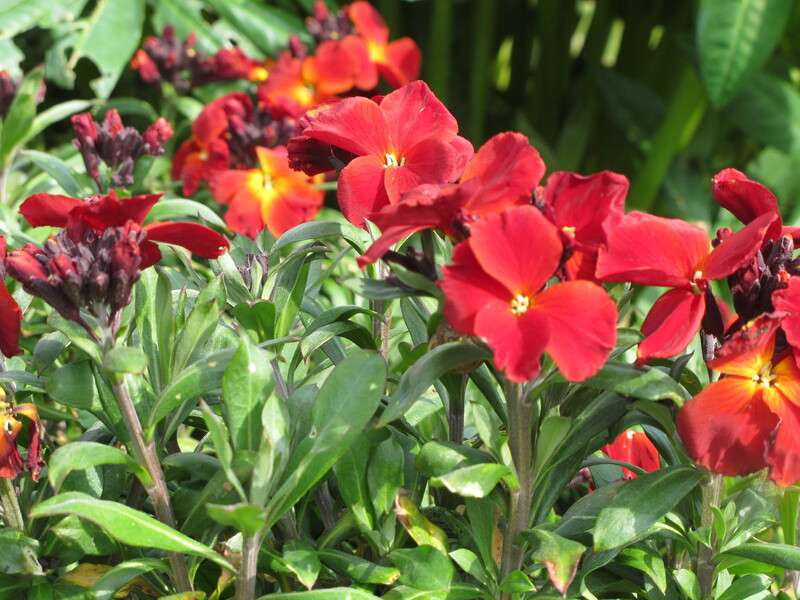 Irrelevant photo: wallflowers, which aren’t people who don’t get asked to dance, but real spring flowers. That grow happily in field walls. But forget the timing; let’s talk about the substance. Apparently animal rights activists have made an impact, even on the bastion of tradition that is the Ministry of Defense. I think it was Margaret Sanger who said something along the lines of “Never think that a small, determined band of people cannot change the world. Indeed, throughout history it is the only thing that ever has.” Or something like that. I’m working from (a screamingly imperfect) memory, so that may turn out to be a quote from Groucho Marx, and the quote may have been something along the lines of “Outside of a dog, a book is man’s best friend. Inside of a dog, it’s too dark to read.” What I can say for certain is that there’s a quote out there somewhere. From someone. And it’s great. It might even be relevant, depending on whether it’s the one about changing the world or the one about the dog. But I’ve wandered, haven’t I? The bearskin replacements are 18 inches tall. You might think a hat that tall would draw unwelcome attention on the battlefield, but 18th-century British troops weren’t known for their guerrilla tactics, and maybe once you convince yourself that a bright red jacket is a good idea, a foot-and-a-half-high hat doesn’t strike you as a problem. The hats, according to the Mirror article, are made from the skins of Canadian black bears, and 100 new hats are needed each year. Why 100? It doesn’t say. Do they have 100 new recruits each year? Do they only have 3, but 97 of the existing soldiers leave their hats in pubs when they stop off after work and never find them again? Do the moths eat holes in them? I just don’t know. What I can tell you is that each hat requires the skin of an entire bear. Now I lived in Minnesota long enough to know that bears are bigger than hats. Much bigger than hats. Even foot-and-a-half high hats. Even the relatively small black bear. Ah, but are the hats really are made from the skins of black bears? The Royal Hats website (yes, my friends, there is either a website or a blog out there about everything; every single thing) claims they’re made from the skins of brown bears, which have thicker pelts than black bears. Then they’re dyed. Who’s right? I don’t know. I haven’t found an official government website that covers the topic, important though it is. Good thing it wasn’t a question in the Life in the U.K. Test or I’d have been kicked out of the country. Where does the rest of the bear go? Dunno again. I do know that each hat ends up weighing 1.5 pounds. The army argues that the bears—whether black or brown—are culled anyway to keep the populations in check, so no bears are killed specifically to make the hats and therefore it’s okay. They add that the hats are a symbol of Britain recognized around the world. If they have anything to say about whether the world, having recognized the hats, takes them seriously, I failed to find it. The Independent does date its articles, and in 2008 wrote that the hats were “likely” to be replaced, and that Stella McCartney or Vivienne Westwood might be designing the replacements. No, it’s not dated on April Fool’s day; it was posted in August. Apparently, the Ministry of Defense would be meeting with “leading designers” on the question. Now that’s a meeting I’d love to have reported on. Forget the hats—I’ll never be a fashion blogger—what I’d have been listening for was how the two groups communicated. If at all. Since the only thing I know about Westwood is how to spell her name, I punched her into Google. She offers a nice little swimsuit with a strategically printed fig leaf for £220 pounds. The male equivalent is a steal at £125. The models, I have to say, do not look happy in them, and I don’t blame them. The suits are—as folks in Minnesota say when they disapprove of something—interesting. And Stella McCartney? She’s offering a fizzy little black dress for £1,795. Sorry: No male equivalent seems to be available. Neither the swimsuit or the dress strikes me as an obvious choice for the Place Guard, but the times they are a-changin’ and who am I to close off possibilities? It must’ve been an interesting meeting, but I can’t find any reports on it and they seem not to have agreed on a replacement hat, because the bearskins are still in use. And what, you might want to know, goes on underneath the hat? Well, one guy got really and truly bored under his and started cutting up in front of Buckingham Palace. My only question is why don’t they all? The Ministry of Defense assured the press that he wasn’t likely to be jailed for it. Jailed? I know there are things about tradition that I don’t understand, but aren’t they over-reacting a bit by even considering it? In the meantime, anti-fur activists continue to put pressure on the Ministry of Defense, and I’m going to take advantage of that and set up a meeting to discuss replacing the bearskin with a tasteful little flowered sunhat. The Palace Guard doesn’t throw grenades anymore, so the brims shouldn’t be a problem. I’m sure they’ll be interested. This entry was posted in Intercultural Mayhem, Traditions and tagged Americans in Britain, Americans in England, anglophile, bearskin hats, Britain, England, humor, Palace Guard by Ellen Hawley. Bookmark the permalink. Quite an interesting subject, don’t you think? Far more so than I expected. I often play a game, “What is the most boring job in the world?” On bad days, I feel it is my own. On good days, tollbooth toll-takers win, but now Buckingham Palace Guard is definitely in the running. I can’t imagine what mental games they have to play in order to stay awake. “There’s a dead bear on my head, there’s a dead bear on my head”…..
Best comment in a long, long time. And the competition’s been pretty fierce. Thank you for that. Hah har! Up the Irish! Oh sorry, I got carried away. All this talk of colonial aggression…. Now I have a big head! Perfect. It’ll just fit one of those hats. Lo entendi, but I can’t find the damn accent marks. Hah! I enjoyed this…..a bit of actual history with a whole lot of funny. Great post! “Why, thank you,” she said modestly. Not entirely on-topic, but as you mentioned it, the red uniforms were actually to increase their visibility on the battlefield, intentionally. The gunpowder used in that era created so much smoke that five minutes into a battle you couldn’t see the guys on your own side, never mind the enemy. The brightly coloured uniforms were so you could be sure you’re not shooting your own guys by mistake. Likewise the American forces in the liberation war wore blue, and I think Napoleon’s troops also fought in blue. By the time England occupied South Africa and India, less smoky gunpowder was in use, and they switched to the sand-coloured or khaki uniforms that blended in with the environment more effectively. On the foot-and-a-half high hat I’ve got nothing. That really is interesting. The belief I picked up as a kid–and I’m guessing it’s a pretty common American belief–was that it was a mix of arrogance and tradition. You know: We do it this way because we do it this way, and it would be cowardly to hid from a musket ball anyway. Or something along those lines. I never stopped to question that, or to think there may have been some logic to it all. I never heard the term lobsterback, only redcoat. Which proves nothing at all–especially since I didn’t know the American soldiers wore bright blue. I was left with the impression that they fought a more guerrilla-style was than the British. But I would very seriously advise everyone not to take my word for it. Yeah, I wouldn’t think we should look to Mel Gibson for historical accuracy. But the militia/army distinction makes a lot of sense. Boy, the things I don’t know about my own history! I think the 1.5 foot hats are quite clever, actually. Because obviously the enemy, being by definition stupid, would assume the head was at the top. Thanks for that. An obvious conclusion that I didn’t jump to. Silly me. The things you learn when people ask questions! I have never heard of the “liberation war.” Is that the Revolutionary War? Thanks for the accurate quote. I see my memory added some frills, for reasons I can’t begin to explain. And yes, the “liberation war” would, I’m pretty sure, be the American Revolution. The writer’s South African; I’m assuming that explains the different terminology. Anybody from this side of the Atlantic care to weigh in on that?? I had never particularly pondered the history and origins of the hats other than thinking how ridiculous and uncomfortable they looked. I consider myself enlightened by having read your amusing account of your research. I sincerely hope that they do not in fact use an entire bear to make each hat. A hundred bears a year killed to make stupid-looking headwear cannot be environmentally sound by anyone’s reckoning. Faux fur is rather good quality these days. Time to make the switch I think. Or just rethink the whole hat design entirely. The articles I read contained some very serious quotes on the problems with faux fur (sounds like it doesn’t handle the rain well, since the faux species evolved in an indoor climate). I vote for rethinking the whole design. I’d love to know how they keep the things on. The chinstraps can’t possibly be enough. Think they’ve brought back the hatpin? Clearly I know nothing about faux fur so I had best not order that Raquel Welch bikini then. Perhaps their swords double as hatpins. I think a redesign would be great. Perhaps they could have small children enter a competition to design it. They certainly could not come up with a worse idea. I’ll suggest that when they turn down my idea about the sunhat. That’s a shame about the bikini, although it might get heavy when it’s wet. So … they kill 100 bears a year? Where do they find them??? I didn’t know England still had any bears … is this why they’re still hanging onto Canada? Mmmm, I think the Canadians might beg to differ about whether Britain’s hanging onto it. But if it left the Commonwealth, its bears might sleep easier. And the MoD would have to get serious about replacing the hats, because you’re right: no bears left in Britain. My dog’s very small, so I’ve never tried that reading inside business. Even with a big dog, it never did strike me as practical. I’m not sure about the Wizard of Oz guards. But I do know the Palace Guards don’t encourage overfamiliarity with their hats, so it’s not surprise you hadn’t noticed. It’s funny, though, how you can see something–or a picture of it–a hundred times and not stop to ask, What’s that made of anyway? It doesn’t get all that hot here. Although, having said that, when London gets hot, it’s not prepared for it–not much in the way of cross-ventilation or that sort of thing. But the hat? I’d pass out from embarrassment. Yes! Ask me anything. I know nothing and will answer–well, no, actually not everything. But I’m happy to tell the world more than I kknow. I’ll look forward to hearing from you about the joint post. You are not the only person to answer questions they don’t know the answer to. But you definitely do it well! 100 new hats a year, eh? Maybe the old ones are culled by the fashion police. …and replaced with identical ones. Now that’s determination. You almost have to admire it. Old (bwahahaha) hat! I absolutely loved this post. I *knew* I couldn’t have been the only American who wondered about this pressing issue. I’m here to answer all important questions. Or–well, okay, some of them. So shoot me any other Britain-related questions that are lodged at the back of your mind, and if I can do anything informative and absurd with them, I’ll be delighted to. Why are there words with whole syllables missing? How could Worcester only have two syllables? Where do the L and the W go when you say Alnwick out loud? Good one. I’m not sure there’s a rational answer for anything about the English language, but trying to answer should be fun. Fascinating material delightfully presented. If I were those bears, I’d run for the hills. Can’t they use some kind of material that looks like the real fur? Apparently, fake fur looks nasty when wet, and this is Britain we’re talking about, so count on lots of wet. Plus it goes all funny in the wind. So, basically, they’d end up with bad hat days instead of bad hair days. I don’t think they’ve considered a complete redesign. Y’know, to something marginally more practical. I never stop being enraged at the cruelty with which animals everywhere are treated. The other fur hat used in the British military is the busby, worn by the Hussars (Royal Horse Artillery). It is now made from faux fur. Ah ha! So now we have to find a way to put the two branches of the military in touch with each other. Pingback: English place names: where did the missing syllables go? | Notes from the U.K. Thank you for answering my question, sort of. I may have to explore it from the bears’ perspective. I wouldn’t think they’re in love with this tradition. And I can’t say I blame them.